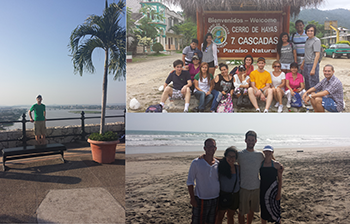 The NSCC Ecuador trip is an international exchange program offered by a popular university in Ecuador. The Universidad de Especialidades Espíritu Santo (UEES) is among the country`s top rated universities and is located in the city of Guayaquil. They take students from all over the world and provide them with cultural orientation and a short term of schooling. The different programs they offer vary in length depending on where you are coming from and how your school is involved. Each new international class that UEES receives incorporates students from several different schools whom are studying a variety of different things. The first part of the trip includes a cultural orientation and then classes and volunteering begins. Orientation is about 3 days and then the university matches students with a host family which is where the majority of your time is spent while going to class and volunteering. UEES is partnered with a number of different social organizations in Guayaquil which they regularly provide volunteers. Students are given a list of different choices and an opportunity to visit a few different places before deciding. Classes and volunteering are Monday to Thursday and the weekend is for adventures. When I signed up for this trip there was very little information about what was involved. I knew it was 6 weeks in Ecuador, I was told to book my flights for when & where, and I also had taken part in the NSCC online pre-departure course (which gives general information about international travelling). A more detailed itinerary was provided about two weeks before the departure and even that did not give me enough information to form any expectations. Preparing to go was very nerve wrecking and involved a few sleepless nights before the departure. The Quito Airport is unique from a lot of others because when the plane lands the monitor will say that you are at 7300 ft. above sea level. You do not really recognize the difference at night because you cannot see the mountains around you but you need to be mindful of when you run and when you take stairs because you can get winded easily. The following three days in Quito where amazing. We were shown so much and did so much but those details would make a long story too long. After three days in Quito, we flew to Guayaquil which is a larger city to the south. Quito has a population of 1.5 million and Guayaquil has a population of 2.5 million. As well, Guayaquil is almost at sea level so it is easier to breath and much hotter. Seasons in Ecuador include; June to September, which is the hot dry season and the rest of the year, is the even hotter but wet season. Daily temperatures in June and July seem to stay between 32 – 38 Celsius and go down to 24 – 27 Celsius at night. Week days include Spanish classes in the afternoon and a volunteer placement in the morning. The place I chose to work at is called Casa de Padre Damian. The foundation was set up by a Nun from New York who came to Ecuador almost 30 years ago. It is a place where people with Hansen’s disease can go to be cured and recover. Hansen’s disease is also known as Leprosy and it can carry a huge stigma about what it really is. Even today the general public does not want to deal with those who are infected even though people can be cured of the infection. Many governments would rather hide the disease which can lead to the patients never being cured and very poor living conditions. Casa de Padre Damian has a number of patients who need to live there permanently because they need the extra attention or they have been abandoned by their family. What attracted me to the place was the positivity of the people that live there. The patients and workers have been through and are going through some hard times however when you are around them you can feel the positive atmosphere they give off. Each person there is aware of this energy and they work hard at maintaining it so that all guests can feel welcome. On the weekends there is always something to do. Ecuador has so much diversity and travelling is so cheap there is no excuse not to explore. Bus transit in the city costs $0.35 and if you need to go to another province you would be looking at 3-10 dollars. I have not paid more than 4.15 for a bus fair and that was 2 hours away. There are mountains, jungles, beaches, and exotic city attractions all within a day`s travel from Guayaquil. Yes, it is important to be careful of your safety when travelling but the people in this country are extremely generous and often curious about travellers. If you show an interest in learning about their country, culture, and history they will open up to you more easily and you will find that they are very warm and welcoming people. Knowing some Spanish will go a long way as the majority of the population can only speak the one language. However Ecuador has a very young population and many of the schools in the country are now teaching English so I have noticed that a lot of the young people are interested in trying to speak to English with travelers. This trip will help me with my future career for a number of different reasons but most of all the relationships that I have developed here have made me a better person. Here in Ecuador I have had the opportunity to develop several new friends including the people at the foundation, the school, the neighbors, and the family who have so generously taken me into their home. The Suarez Flores family have taught me so much about their culture and really treated me like one of their own children. My host mother cooks me a large meal three times a day which always amazes me and then she sits down and helps with my Spanish. The people at the foundation and the faculty at the university are always ready and willing to reach out and lend a hand. The people I have meet on the weekend whom tell me about Ecuador and their families have inspired me. Everyone here has showed me the benefits that come with working on a relationship. I will take this lesson with me back to Canada and continue to develop good relationships including the ones at work. hi Kevin – thanks for taking the time to capture some of your learning here for others to share. It’s really wonderful to read about your time there…enjoy it all!